UK Culture. UK history, language,concepts, activities, civilization, literature and behaviour. Click here to go to ' The USA culture ' page. Though the UK has no official language, English is the main language and is spoken monolingually by an estimated 95% of the UK population. However, individual countries within the UK have frameworks for the promotion of their indigenous languages. In Wales, all pupils at state schools must study Welsh until aged 16, and the Welsh Language Act 1993 and the Government of Wales Act 1998 provide that the Welsh and English languages should be treated equally in the public sector, so far as is reasonable and practicable. Irish and Ulster Scots enjoy limited use alongside English in Northern Ireland. The Gaelic Language (Scotland) Act, passed by the Scottish Parliament in 2005, recognized Gaelic as an official language of Scotland, commanding equal respect with English, and required the creation of a national plan for Gaelic to provide strategic direction for the development of the Gaelic language. The earliest existing native literature of the territory of the modern United Kingdom was written in the Celtic languages of the isles. The Welsh literary tradition stretches from the 6th century. Irish poetry also represents a more or less unbroken tradition from the 6th century to the present day, with the Ulster Cycle being of particular relevance to Northern Ireland. Anglo-Saxon literature includes Beowulf, a national epic, but literature in Latin predominated among educated elites. After the Norman Conquest, Anglo-Norman literature brought continental influences to the isles. English literature emerged as a recognisable entity in the late 14th century and, by the time of the foundation of the United Kingdom, was the dominant literature. The early 18th century is known as the Augustan Age of English literature. The poetry of the time was highly formal, as exemplified by the works of Alexander Pope The English novel became a popular form in the 18th century, with Daniel Defoe's Robinson Crusoe (1719), Samuel Richardson's Pamela (1740) and Henry Fielding's Tom Jones (1745). From the late 18th century, the Romantic period showed a flowering of poetry comparable with the Renaissance two hundred years earlier and a revival of interest in vernacular literature. In the 19th century major poets in English literature included William Blake, William Wordsworth, John Keats, Alfred Lord Tennyson, Elizabeth Barrett Browning, Percy Shelley and Lord Byron. The Victorian period was the golden age of the realistic English novel, represented by Jane Austen, Brontë sisters (Charlotte, Emily and Anne), Charles Dickens, William Thackeray, George Eliot and Thomas Hardy. World War I gave rise to British war poets and writers such as Wilfred Owen, Siegfried Sassoon, Robert Graves and Rupert Brooke who wrote (often paradoxically), of their expectations of war, and/or their experiences in the trench. Rudyard Kipling If— (1896). Doubleday Page and Company 1910. The Celtic Revival stimulated new appreciation of traditional Irish literature, however, with the independence of the Irish Free State, Irish literature came to be seen as more clearly separate from the strains of British literature. The Scottish Renaissance of the early 20th century brought modernism to Scottish literature as well as an interest in new forms in the literature of Scottish Gaelic and Scots. The English novel developed in the 20th century into much greater variety and was greatly enriched by immigrant writers. It remains today the dominant English literary form. The United Kingdom has had a vibrant tradition of theatre, much of it inherited from England and Scotland. In the 18th century, the highbrow and provocative Restoration comedy lost favour, to be replaced by sentimental comedy, domestic tragedy such as George Lillo's The London Merchant (1731), and by an overwhelming interest in Italian opera. Popular entertainment became more important in this period than ever before, with fair-booth burlesque and mixed forms that are the ancestors of the English music hall. These forms flourished at the expense of legitimate English drama, which went into a long period of decline. By the early 19th century it was no longer represented by stage plays at all, but by the closet drama, plays written to be privately read in a "closet" (a small domestic room). In 1847, a critic using the pseudonym Dramaticus published a pamphletdescribing the parlous state of British theatre. Production of serious plays was restricted to the patent theatres, and new plays were subjected to censorship by the Lord Chamberlain's Office. At the same time, there was a burgeoning theatre sector featuring a diet of low melodrama and musical burlesque; but critics described British theatre as driven by commercialism and a 'star' system. In July 1962, a board was set up to supervise construction of a National Theatre in London and a separate board was constituted to run a National Theatre Company and lease the Old Vic theatre. The Company was to remain at the Old Vic until 1976, when the new South Bank building was opened. A National Theatre of Scotland was set up in 2006. Today the West End of London has a large number of theatres, particularly centred around Shaftesbury Avenue. A prolific composer of the 20th century Andrew Lloyd Webber has dominated the West End for a number of years and his musicals have travelled to Broadway in New York and around the world, as well as being turned into films. The Royal Shakespeare Company operates out of Stratford-upon-Avon, producing mainly but not exclusively Shakespeare's plays. Important modern playwrights include Alan Ayckbourn, John Osborne, Harold Pinter, Tom Stoppard, and Arnold Wesker. Composers William Byrd, Thomas Tallis, John Taverner, John Blow, Henry Purcell, Edward Elgar, Arthur Sullivan, William Walton, Ralph Vaughan Williams, Benjamin Britten and Michael Tippett have made major contributions to British music, and are known internationally. Living composers include John Tavener, Harrison Birtwistle, Andrew Lloyd Webber, Oliver Knussen, Harry Gregson Williams, Mike Oldfield, John Rutter, James MacMillan, Joby Talbot, John Powell, David Arnold, John Murphy, Brian Eno, Clint Mansell, Craig Armstrong, Michael Nyman and John Barry. The United Kingdom also supports a number of major orchestras including the BBC Symphony Orchestra, the Royal Philharmonic Orchestra, the Philharmonia, the London Symphony Orchestra and the London Philharmonic Orchestra. London is one of the world's major centres for classical music: it holds several important concert halls and is also home to the Royal Opera House, one of the world's leading opera houses. British traditional music has also been very influential abroad. Television Centre, the main broadcasting centre for the BBC, situated in White City, London. The UK has been at the forefront of developments in film, radio, and television.Many important films have been produced in the UK over the last century, and a large number of significant actors and film-makers have emerged. Currently the main film production centres are at Shepperton and Pinewood Studios. Broadcasting in the UK has historically been dominated by the BBC, although independent radio and television (ITV, Channel 4, Five) and satellite broadcasters (especially BSkyB) have become more important in recent years. BBC television, and the other three main television channels are public service broadcasters who, as part of their license allowing them to operate, broadcast a variety of minority interest programming. The BBC and Channel 4 are state-owned, though they operate independently. The United Kingdom has a large number of national and local radio stations which cover a great variety of programming. The most listened to stations are the five main national BBC radio stations. BBC Radio 1, a new music station aimed at the 16-24 age group. BBC Radio 2, a varied popular music and chat station aimed at adults is consistently highest in the ratings. BBC Radio 4, a varied talk station, is noted for its news, current affairs, drama and comedy output as well as The Archers, its long running soap opera, and other unique programmes. The BBC, as a public service broadcaster, also runs minority stations such as BBC Asian Network, BBC 1xtra and BBC 6 Music, and local stations throughout the country. From the foundation of the United Kingdom, the English school of painting is mainly notable for portraits and landscapes, and indeed portraits in landscapes. Among the artists of this period are Sir Joshua Reynolds (1723–1792), George Stubbs (1724–1806), and Thomas Gainsborough (1727–1788). William Hogarth painted far more down to earth portraits and satires, and was the first great English printmaker. The Pre-Raphaelite Brotherhood (PRB) achieved considerable influence after its foundation in 1848 with paintings that concentrated on religious, literary, and genre subjects executed in a colorful and minutely detailed style. PRB artists included John Everett Millais, Dante Gabriel Rossetti and subsequently Edward Burne-Jones. Also associated was designer William Morris, whose efforts to make beautiful objects affordable (or even free) for everyone led to his wallpaper and tile designs defining the Victorian aesthetic and instigating the Arts and Crafts movement. Visual artists from the United Kingdom in the 20th century include Francis Bacon, David Hockney, Bridget Riley, and the pop artists Richard Hamilton and Peter Blake. As a reaction to abstract expressionism, pop art emerged originally in England at the end of the 1950s. The 1990s saw the Young British Artists, Damien Hirst and Tracey Emin. New York-born Sir Jacob Epstein was a pioneer of modern sculpture. Arts institutions include the Royal College of Art, Royal Society of Arts, New English Art Club, Slade School of Art, Royal Academy, and the Tate Gallery. Norman Foster's 'Gherkin' (2004) rises above the 13th century church St Helen's Bishopsgate in the City of London. The architecture of the United Kingdom is diverse. The Forth Railway Bridge is a cantilever bridge over the Firth of Forth in the east of Scotland. It was opened in 1890, and is designated as a Category A listed building. The architecture of the United Kingdom includes many features that precede the creation of the United Kingdom in 1707, from as early as Skara Brae and Stonehenge to the Giant's Ring, Avebury and Roman ruins. In most towns and villages the parish church is an indication of the age of the settlement. Many castles remain from the medieval period. Over the two centuries following the Norman conquest of England of 1066, and the building of the Tower of London, castles such as Caernarfon Castle in Wales and Carrickfergus Castle in Ireland were built. One of the best known British architects working at the time of the foundation of the United Kingdom was Sir Christopher Wren. He was employed to design and rebuild many of the ruined ancient churches of London following the Great Fire of London. His masterpiece, St Paul's Cathedral, was completed in the early years of the United Kingdom. In the early 18th century baroque architecture — popular in Europe — was introduced, and Blenheim Palace was built in this era. However, baroque was quickly replaced by a return of the Palladian form. The Georgian architecture of the 18th century was an evolved form of Palladianism. Many existing buildings such as Woburn Abbey and Kedleston Hall are in this style. Among the many architects of this form of architecture and its successors, neoclassical and romantic, were Robert Adam, Sir William Chambers, and James Wyatt. In the early 19th century the romantic medieval gothic style appeared as a backlash to the symmetry of Palladianism, and such buildings as Fonthill Abbey were built. By the middle of the 19th century, as a result of new technology, construction was able to develop incorporating steel as a building component; one of the greatest exponents of this was Joseph Paxton, architect of the Crystal Palace. Paxton also continued to build such houses as Mentmore Towers, in the still popular Renaissance styles. From the time of the Scientific Revolution, England and Scotland, and thereafter the United Kingdom, have been prominent in world scientific and technological development. The Royal Society serves as the national academy for sciences, with members drawn from many different institutions and disciplines. Formed in 1660, it is the oldest learned society still in existence. Isaac Newton's Principia is one of the most influential works in the history of science. This is Newton's copy of the first edition annotated by him for the second edition of 1713. Isaac Newton's publication of the Principia Mathematica ushered in what is recognisable as modern physics. The first edition of 1687 and the second edition of 1713 framed the scientific context of the foundation of the United Kingdom. He realised that the same force is responsible for movements of celestial and terrestrial bodies, namely gravity. Since Newton's time, figures from the UK have contributed to the development of most major branches of science. Examples include Michael Faraday, who, with James Clerk Maxwell, unified the electric and magnetic forces in what are now known as Maxwell's equations; James Joule, who worked extensively in thermodynamics and is often credited with the discovery of the principle of conservation of energy; Paul Dirac, one of the pioneers of quantum mechanics. William Thomson (Baron Kelvin) drew important conclusions in the field of thermodynamics and invented the Kelvin scale of absolute zero; and he was the creator of Bell's Theorem, John Stewart Bell. Other British pioneers in their field include; Joseph Lister (Antiseptic surgery), Edward Jenner (Vaccination), Florence Nightingale (Nursing), Richard Owen (Palaeontology), Howard Carter (Modern Archaeology). William Sturgeon invented the electromagnet in 1824. The first commercial electrical telegraph was co-invented by Sir William Fothergill Cooke and Charles Wheatstone. Cooke and Wheatstone patented it in May 1837 as an alarm system, and it was first successfully demonstrated on 25 July 1837 between Euston and Camden Town in London. 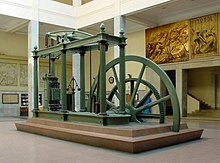 A Watt steam engine, the steam engine that propelled the Industrial Revolution in Britain and the world. Technologically, the UK is also amongst the world's leaders. Historically, it was at the forefront of the Industrial Revolution, with innovations especially in textiles, the steam engine, railroads and civil engineering. Famous British engineers and inventors from this period include James Watt, Robert Stephenson, Richard Arkwright, and the 'father of Railways' George Stephenson. Engineer Isambard Kingdom Brunel is best known for creating the Great Western Railway,as well as steamships. Since then, the United Kingdom has continued this tradition of technical creativity. Alan Turing (leading role in the modern computer), Scottish inventor Alexander Graham Bell (the first practical telephone), John Logie Baird (world's first working television system, first electronic colour television) Frank Whittle (inventor of the jet engine), Charles Babbage (who devised the idea of the computer) and Alexander Fleming (discoverer of penicillin) were all British. Other famous scientists, engineers and inventors from the UK include: Richard Trevithick, Francis Crick, Rosalind Franklin, Robert Hooke, Humphry Davy, Robert Watson-Watt, Frederick Soddy, J. J. Thomson, Frank Pantridge, Sir George Everest, Daniel Rutherford, Arthur Eddington, Lord Rayleigh, Richard Dawkins, Stephen Hawking and Joseph Priestly . The United Kingdom was created as a Protestant Christian country and Protestant churches remain the largest faith group in each country of the UK. Following this is Roman Catholicism and religions including Islam, Hinduism, Sikhism, Judaism, and Buddhism. While 2001 census information suggests that over 75 percent of UK citizens consider themselves to belong to a religion, Gallup International reports that only 10 percent of UK citizens regularly attend religious services. A 2004 YouGov poll found that 44 percent of UK citizens believe in God, while 35 percent do not. Fish and chips, a popular take-away food of the United Kingdom. Each country within the United Kingdom has its own specialities: English cuisine for example: bangers and mash, Cheshire cheese and the Yorkshire pudding; Scottish cuisine includes Arbroath Smokie and Haggis; Irish cuisine features the Ulster fry and Irish Stew and Welsh cuisine is noted for Welsh rarebit. Each country of the United Kingdom has a separate education system. Power over education matters in Scotland, Wales and Northern Ireland is devolved but education in England is dealt with by the UK government since there is no devolved administration for England. Most schools came under state control in the Victorian era, a formal state school system was instituted after the Second World War. Initially schools were separated into infant schools (normally up to age 4 or 5), primary schools and secondary schools (split into more academic grammar schools and more vocational secondary modern schools). Under the Labour governments of the 1960s and 1970s most secondary modern and grammar schools were combined to become comprehensive schools. Most primary and secondary schools in both the private and state sectors have compulsory school uniforms. Allowances are almost invariably made, however, to accommodate religious dress including the Islamic hijab and Sikh bangle (kara). Although the Minister of Education is responsible to Parliament for education, the day to day administration and funding of state schools is the responsibility of Local Education Authorities. England's universities include the so-called Oxbridge universities of (Oxford University and Cambridge University) which are amongst the world's oldest universities and are generally ranked top of all British universities. Some institutions are world-renowned in specialised and often narrow areas of study, such as Imperial College London (science and engineering) and London School of Economics (economics and social sciences). Scotland has a long history of universal provision of public education which, traditionally, has emphasised breadth across a range of subjects compared to depth of education over a smaller range of subjects at secondary school level. The majority of schools are non-denominational, but by legislation separate Roman Catholic schools, with an element of control by the Roman Catholic Church, are provided by the state system. The National Assembly for Wales has responsibility for education in Wales. A significant number of students in Wales are educated either wholly or largely through the medium of Welsh and lessons in the language are compulsory for all until the age of 16. 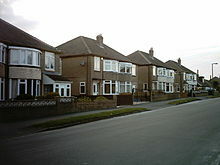 Typical 20th Century, three-bedroom semis in Austhorpe, Leeds designed for family living. Historically most people in the United Kingdom lived either in conjugal extended families or nuclear families. This reflected an economic landscape where the general populace tended to have less spending power, meaning that it was more practical to stick together rather than go their individual ways. This pattern also reflected gender roles. Men were expected to go out to work and women were expected to stay at home and look after the families. In the 20th century the emancipation of women, the greater freedoms enjoyed by both men and women in the years following the Second World War, greater affluence and easier divorce have changed gender roles and living arrangements significantly. The general trend is a rise in single people living alone, the virtual extinction of the extended family (outside certain ethnic minority communities), and the nuclear family arguably reducing in prominence. From the 1990s, the break up of the traditional family unit, when combined with low interest rate environment and other demographic changes, has created great pressure on the housing market, in particular regarding the accommodation of key workers such as nurses, other emergency service workers and teachers, who are priced out of most housing, especially in the South East. Some research indicates that in the 21st century young people are tending to continue to live in the parental home for much longer than their predecessors.. The high cost of living, combined with rising cost of accommodation, further education and higher education means that many young people cannot afford to live independent lives from their families. The national sport of the UK is football, having originated in England, and the UK has the oldest football clubs in the world. The home nations all have separate national teams and domestic competitions, most notably the Barclays Premier League, the FA Cup, and the Scottish Premier League. The first ever international football match was between Scotland and England in 1872. The match ended goalless. Other famous sporting events in the United Kingdom include the Wimbledon tennis championships, the Grand National, the London Marathon, the Six Nations rugby championships, the British Grand Prix, The Open Championship, The Ashes cricket series and The Boat Race. A great number of major sports originated in the United Kingdom, including football, squash, golf, tennis, boxing, rugby league, rugby union, cricket, field hockey, snooker, billiards, badminton and curling. There is no national costume of the United Kingdom though the individual countries have distinctive forms of national dress: Scotland has the kilt, accompanied by sporran and sgian dubh, as well as the Tam o'shanter; England has the costumes of Morris dancers.